Learn about Aboriginal culture with an interactive experience. This half-hour guided tour along an all weather walk-way modelled on the Rainbow Serpent gives you fascinating insight into aspects of aboriginal culture. Try your hand at boomerang throwing - after a demonstration and a few lessons, you’ll be ready to test your skills with this ancient aboriginal implement. The area is specially netted for your safety, as boomerangs do come back! Observe spear-throwing - you'll be amazed at the distance the Pamagirri Guides can throw spears using a Woomera. One of our Guides, Jauwa, is listed in the Guinness Book of Records with a distance of 147.75 metres – that’s one and a half football fields! This natural setting provides a beautiful backdrop for The Pamagirri Corroboree, depicting aspects of including animals, food gathering, and hunting. The rainforest serves as the theatre walls whilst sounds of wildlife provide accompaniment to the haunting sounds of the didgeridoo and clapsticks. Here you'll see traditional Aboriginal dwellings and hear you Pamagirri Guide playing the didgeridoo, an ancient instrument. Listen carefully for sounds imitating Kangaroos or the Kookaburra. 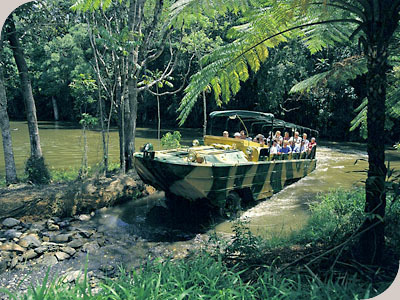 Experience the tropical rainforest from a totally unique perspective - aboard an amphibious World War II Army Duck. 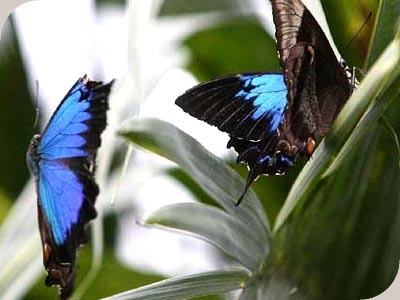 As you traverse through rainforest, your guide will point out and explain ferns, orchids, strangler figs and stinging trees, as well as birds such as the Azure Kingfisher and a host of other animals and reptiles. 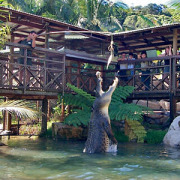 Splash into the lake and cruise up to the waters edge whilst turtles, fish and eels swim up close. Keep an eye out for water dragons or python’s sunbaking or slithering up trees. 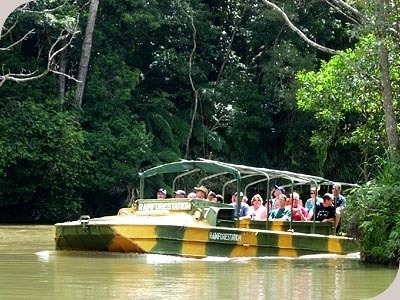 Wander at your leisure or join a guided group with experienced Wildlife Keepers. 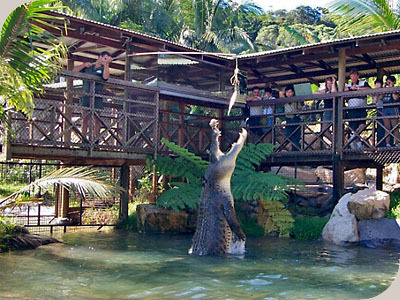 Covered boardwalks provide excellent viewing of native Australian animals, including crocodiles, wombats, dingoes, snakes, lizards and the cassowary. Hand feed kangaroos and wallabies. Safely view smaller freshwater crocodiles and their larger estuarine cousins, including "Jack The Ripper", one of the largest saltwater crocodiles in captivity - at over 5 metres in length, he weights almost one tonne! Meet Keita the cassowary, a large, flightless bird. See endangered wild dingoes. Learn about the exotic tropical fruits of the region and the world, with over 40 species on display including jackfruit, paw paw, lychees, mango, cocoa, carambolia, star apple and pineapple as well as regional produce such as tea, coffee and sugar cane. Colonial Restaurant is open for snacks, morning and afternoon tea. Outback Restaurant styled as a traditional Aussie Outback venue, is ideal for BBQ lunches. 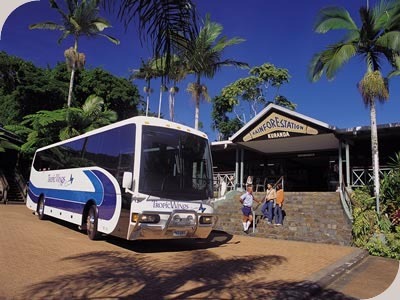 Shuttle Bus from Australian Butterfly Sanctuary to Rainforestation Nature Park is included in the cost when this Rainforestation visit is combined with a Tropic Wings Kuranda Tour. 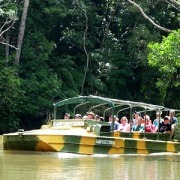 Fantastic way to see the rainforest, especially if you are mobility impaired for any reason. The guide was very knowledgeable. Kids loved the army duck. Great staff everyone Very friendly and helpful. The army duck is a must.